We review various mathematical and computational techniques for drug discovery exemplifying some recent works pertinent to group theory of nested structures of relevance to phylogeny, topological, computational and combinatorial methods for drug discovery for multiple viral infections. We have reviewed techniques from topology, combinatorics, graph theory and knot theory that facilitate topological and mathematical characterizations of protein-protein interactions, molecular-target interactions, proteomics, genomics and statistical data reduction procedures for a large set of starting chemicals in drug discovery. We have provided an overview of group theoretical techniques pertinent to phylogeny, protein dynamics especially in intrinsically disordered proteins, DNA base permutations and related algorithms. We consider computational techniques derived from high level quantum chemical computations such as QM/MM ONIOM methods, quantum chemical optimization of geometries complexes, and molecular dynamics methods for providing insights into protein-drug interactions. We have considered complexes pertinent to Hepatitis Virus C non-structural protein 5B polymerase receptor binding of C5-Arylidebne rhodanines, complexes of synthetic potential vaccine molecules with dengue virus (DENV) and HIV-1 virus as examples of various simulation studies that exemplify the utility of computational tools. It is demonstrated that these combinatorial and computational techniques in conjunction with experiments can provide promising new insights into drug discovery. These techniques also demonstrate the need to consider a new multiple site or allosteric binding approach to drug discovery, as these studies reveal the existence of multiple binding sites. Keywords: Combinatorics & drug discovery, Group theory, Docking methods, Molecular dynamics, QM/MM-MD, Viral infections, Computer-aided drug discovery. Keywords:Combinatorics & drug discovery, Group theory, Docking methods, Molecular dynamics, QM/MM-MD, Viral infections, Computer-aided drug discovery. Abstract:We review various mathematical and computational techniques for drug discovery exemplifying some recent works pertinent to group theory of nested structures of relevance to phylogeny, topological, computational and combinatorial methods for drug discovery for multiple viral infections. We have reviewed techniques from topology, combinatorics, graph theory and knot theory that facilitate topological and mathematical characterizations of protein-protein interactions, molecular-target interactions, proteomics, genomics and statistical data reduction procedures for a large set of starting chemicals in drug discovery. We have provided an overview of group theoretical techniques pertinent to phylogeny, protein dynamics especially in intrinsically disordered proteins, DNA base permutations and related algorithms. We consider computational techniques derived from high level quantum chemical computations such as QM/MM ONIOM methods, quantum chemical optimization of geometries complexes, and molecular dynamics methods for providing insights into protein-drug interactions. We have considered complexes pertinent to Hepatitis Virus C non-structural protein 5B polymerase receptor binding of C5-Arylidebne rhodanines, complexes of synthetic potential vaccine molecules with dengue virus (DENV) and HIV-1 virus as examples of various simulation studies that exemplify the utility of computational tools. It is demonstrated that these combinatorial and computational techniques in conjunction with experiments can provide promising new insights into drug discovery. 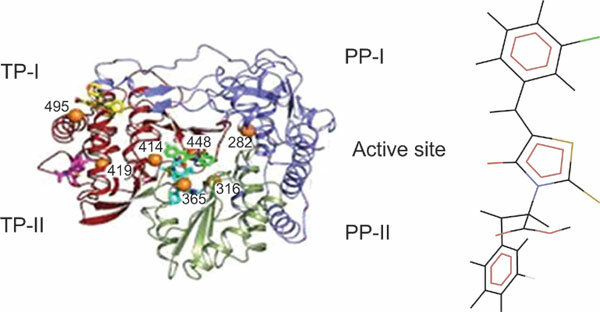 These techniques also demonstrate the need to consider a new multiple site or allosteric binding approach to drug discovery, as these studies reveal the existence of multiple binding sites.